Its name comes from the Latin "obsius". It was the name of the Roman person who discovered this stone in Ethiopia. This stone is sometimes called a volcano glass. It is an igneous volcanic rock which chemical composition is made of aluminum silicates and a big percentage of silica oxide. You can get it by fusing and cooling down acid lava from the rhyolite type. Obsidian can go from transparent to translucide varieties. It can be grey, dark green, red or black. Obsidian was used in certain cultures during the Stone Age because it was easy to carve and you could also get a very good sharp blade. You can find it as knives, lances, arrows, axes… Obsidian can also be polished to get very rustic mirrors. Some traces of its use date back to 1500000 B.C. more especially on the site of Kariandusi that is located on the fault rift in Kenya. The obsidian stone was more particularly used in surgery because it would cut well since 7000 B.C. The most famous surgical operation is probably trepanation where you cut a part of the skull bone to clean a wound or to allow spirits to go in and out. Researchers recently realized that using obsidian with this technique was quite efficient as two thirds of the patients would have survived this kind of operation. In Mesopotamia, you can find obsidian blades from the 5th millennium B.C which material was excavated in Turkey. In the Antique Egypt, obsidian was imported from the Red Sea, Greece and Italy. It was used for different types of decorative objects, jewels and tools. You could also find it in the circumcision rites because of its sharp blade and also because it was a precise tool. The Greeks from the Milos Island understood well the value of obsidian and became rich by making a business of it a long time before discovering iron. In Europe, exchange networks were established since 8000 B.C. between Italy and the south of France to make a business of this stone. This business seemed to be organized by the carvers who would go for the raw material and would carve a very rustic chunk to carry it. It was only once in the villages that they would make obsidian blades according to the demand. In Mexico, you can find a wooden sword which blades are made of obsidian. This dangerous weapon that was called Macuahuitl would hurt a lot as it could saw and cut at the same time. Each mine is linked to a volcano. Therefore, each mine gives different obsidians. This helped to retrace exchanges with some that were made 400 kilometers away from their original location. This variety also allowed giving different values to different obsidians according to their qualities and their colors. The obsidian stone was sacred among pre-Columbian American people, and more particularly for Aztecs. According to some versions of the creation story, mother Earth or the monster of the earth, Coatlicue, would have given birth to the moon, Coyolxanuhqui and the stars with the help of an obsidian blade. Aztecs would call this stone Iztil or Teotetl. It was particularly associated with the "smoking mirror", the god Tezcatlipoca, who was linked to witchcraft and divination. He was the antithesis of the feather snake, the god Quetzalcoatl. A lot of other gods were also associated to obsidian such as Itzpapalotl or "obsidian butterfly", a dangerous warrior goddess. You could also find Itztlacoliuhqui or "curved obsidian blade", god of cold and frost. Aztecs would also use obsidian mirrors to read the future. They would spill water on the surface of the mirror and would guess shapes that were formed in the reflection. This act was quite linked to the god Tezcatlipoca. On the Peruvian coast, a whole surgical kit would have been found in a Pre-Hispanic grave. There were obsidian knives, spatulas made of whale teeth, cotton balls, rags, bandages, strings and needles. The Navajo tribe would also use obsidian. It was one of the 4 sacred stones, linked to the four sacred mountains located on their territory. The obsidian mountain was Dzil bash'zhini which was identified as the Hesperus mount. In some versions of the creation myth, the heart of man would have been made by the gods with obsidian. The idea of reading the future in an obsidian mirror survived. It was Dr John Dee (1527-1608) who talked again about this. This scientific was part of the court of the Queen of England (alchemist, mathematician, astronomer, magician, astrologer…). He would own a "magic mirror" made of obsidian that Uriel the Angel would have given to him. Actually, it would have been an Aztec mirror that had been brought back after the Conquista. Dr Dee would use it to tell the future and became very famous. It is said that he would have helped to uncover numerous plots against the English crown. Nowadays, obsidian knives are used in cardiac or eye surgeries because the blade is a lot thinner that a steel scalpel. You can find obsidian in other objects such as piano keys or the chess pieces. Mines: Greece, Iceland, Italy, Japan, Mexico, Peru, the USA, Armenia, Azerbaijan, Chili and Guatemala. Obsidian would relieve from pains, inflammations, irritations, cysts, fibroids and tumors. It would help to control infections caused by viruses or bacteria. It would cure colon irritations, gastro, nauseas and man sexual problems. 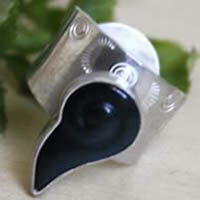 Obsidian would help with muscle pains and would reduce pains linked to arthritis.